Just days after Congress passed a bill allowing states to spend funds supposedly designated for biking and walking on completely unrelated projects, transportation officials are already circling like vultures over that money. 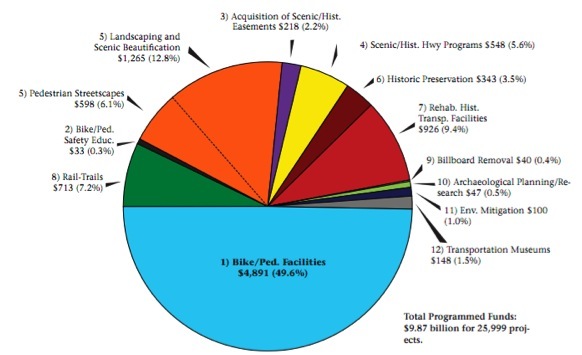 Just to refresh folks’ memory, here’s the actual breakdown of how transportation enhancement grants were spent. As you can see, bicycle and pedestrian projects make up 63.2 percent of the TE pie. Even if you find every single other use of TE funds frivolous, you can’t just pretend that this money doesn’t primarily go to transportation projects that are good for people’s health and the environment. Nice analogy, but it doesn’t work. Here’s a better one: If your teeth are falling out, stop stuffing your face with candy and start brushing and flossing every day. If your infrastructure is in bad shape, stop getting distracted by shiny new projects and spend your money on repair. In no way are bike lanes to blame for states’ infrastructure maintenance problems. 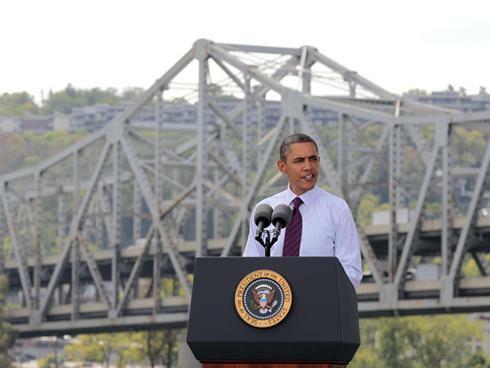 In the case highlighted by the AP, officials are eyeing that money for repairs to the Brent Spence Bridge — which President Obama highlighted last year as his venue for a speech on infrastructure investment. As Obama himself said at the time, “It’s safe to drive on, but it was not designed to accommodate today’s traffic, which can stretch for a mile.” In other words, widening this bridge is like gorging on gum drops. Yet the AP, drawing heavily from a piece by Kentucky Enquirer’s Scott Wartman, quotes uninformed drivers talking about the terror they feel at the very thought of traveling on that bridge. Yes, you might get stuck in traffic, but you’re not going to fall into the Ohio River. Here, the push to widen a road to accommodate more vehicles has mutated into a life-or-death issue. The transportation officials in the story acknowledge that “all the enhancement grants in the country would account for less than half of the Brent Spence Bridge replacement costs” — about a third, in fact — but they still seem to think it’s a pretty good idea to take bike/ped funding away from everyone in the entire country to cover one-third of the cost of widening their perfectly safe bridge. Wartman states that Transportation Enhancements money “built new roads” as well as “improved city streetscapes and bike paths.” But TE was never eligible for road-building. The new Transportation Alternatives program is, though. Only now can states decide not to spend the money for its intended purpose and funnel it to something else. Kentucky is likely to be one of the states that will be all too happy to opt out of the TA program. According to the AP, the state has $18 million in Enhancements money authorized by the federal government since 2009 that it hasn’t allocated. If state officials want to put that money toward replacing the Brent Spence Bridge, under the new law, they’re welcome to do it. But that would be a pretty crazy thing to do, because it would sacrifice all active transportation and streetscaping projects for the whole state just to put a few coins in what’s going to have to be a very big piggy bank. Hey Streetsblog know-it-alls: you may know TE on the coasts, but you are frankly clueless demagogues about the politics of TE in red states. When we say TE is for beatification and historical preservation in Kentucky, that is because that’s what the money has been used for here! Look it up! I can not think of a single road diet, bike lane, or sidewalk built with TE in the ten years I’ve lived here, barring some BS granite sidewalk curbs built at the behest of our politician’s corporate masters. So: TE was already diverted. It was doing transportation bicycling and walking No Good. It will still be diverted, but at least the money will go to transportation uses. Biking and walking can stop being humiliated by losing transpo money to joke non-transpo applications. If the argument is that too much of the money was being allocated outside of infrastructure projects then shouldn’t the answer be to just fix the program by mandating more stringently what types of projects should receive the most funding? By allowing the program to be misappropriated toward more highway/bridge projects you are not only losing the chunk of money that WAS being spent effectively in Kentucky, but also punishing those states that were spending their funds appropriately to being with. Maybe a fair thing to say is, “Most places in the country could use the TA program for its intended use, but a lot of states have more pressing needs to fix roads.” Let’s give those states the benefit of the doubt and say that their streets are pretty complete already, so it’s not like withholding TA money takes bikes or pedestrians off the streets. To that extend, I wouldn’t get bothered about it. The problem is, New York (and its surrounding northeastern states), California, Texas, Florida and Georgia are places with urban areas that do not have complete streets AND the way that roads and neighborhoods were build specifically disenfranchise the poor and/or non-car owners AND they have a lot of traffic on existing roads to boot AND their road infrastructure is falling apart. The TA program was a way to make sure that the mismanagement of highway projects in those areas does not mean that all available money gets tossed into the highway fiscal wormhole. Now… well, plan on any money that could have been used on NECESSARY accessibility projects being instead routed to patching up potholes on the highways so that the big shots in their BMWs and Jaguars and Bentleys don’t get jostled on their way to work.